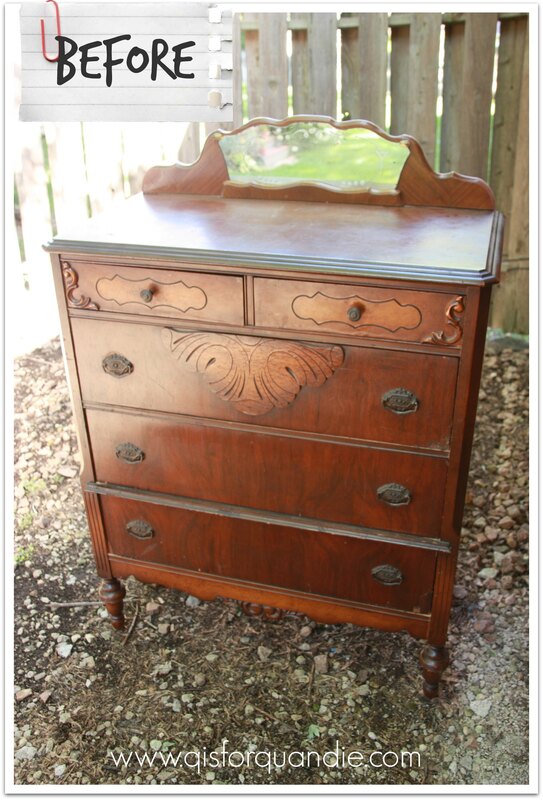 Mr. Q picked up this fabulous little dresser just north of the Twin Cities the other day. The gentleman that was selling it couldn’t believe he wanted to drive all the way up there for this ‘old thing’. It was probably about a 50 minute drive. Not that terrible. Mr Q had to keep reassuring him that his wife likes ‘old’ things, ‘old’ is what we are looking for. And this ‘old thing’ is gorgeous. I loved the big fan detail on the drawer, the curlicue bits on the top drawers, and the hardware is fantastic. When I first saw it on Craigslist, I wasn’t too sure about that mirror piece at the back. I also thought I would paint it either yellow or aqua. Wrong on both counts. 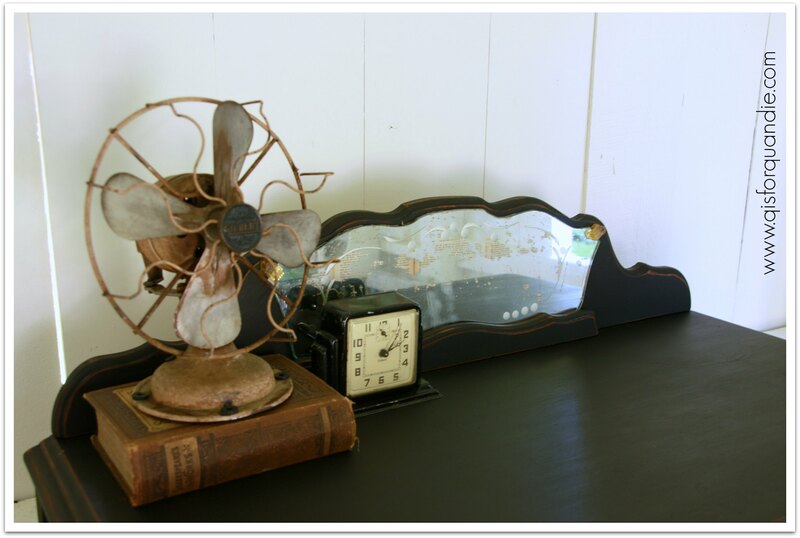 In person, I loved the vintage mirror at the back and I immediately knew I wanted to paint the dresser black and leave the decorative parts wood. I had seen a similar treatment on pinterest, and I wanted to give it a try on this piece. Plus, I had been checking out Miss Mustard Seed’s color focus pin boards on pinterest, and her Typewriter board had me sold. If you haven’t seen these, you should check them out. Every time I break out the MMSMP in Typewriter, I am reminded of how much I love it. If you finish it with the hemp oil, you get the most fabulous deep, rich, black. And it goes on so very easily. 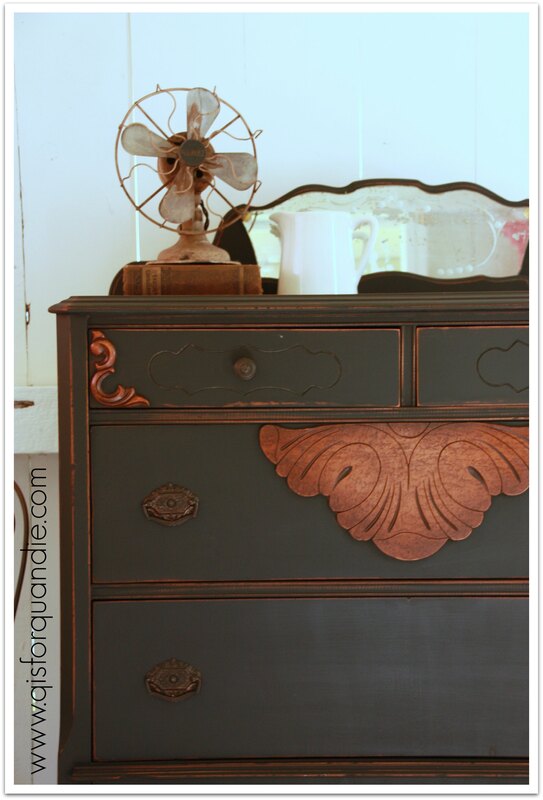 This dresser was an absolute breeze to paint. I did one coat on Thursday evening, and a 2nd quick coat on Friday evening. Once dry I gave it a quick sand and finished with the hemp oil. Easy peasy. Well, I did do a bit of prep work first. I filled some areas where the veneer had chipped using wood filler. I also had to replace some drawer stops. Little fixes that are a part of the process. Then I thoroughly sanded and cleaned it before painting. I did not want a lot of chipping. As you can see, I ended up not getting any chipping. I just got some nice distressed edges when I sanded again after painting. As for the mirror, I had a little fun with that. When I took it apart to paint the back I realized that some of the silvering was chipping off. It reminded me of a fabulous mirror that I saw at the Round Barn that had a bunch of silvering missing and you could see some vintage newspaper behind those spots. Gorgeous. So, I decided to try to copy that look. 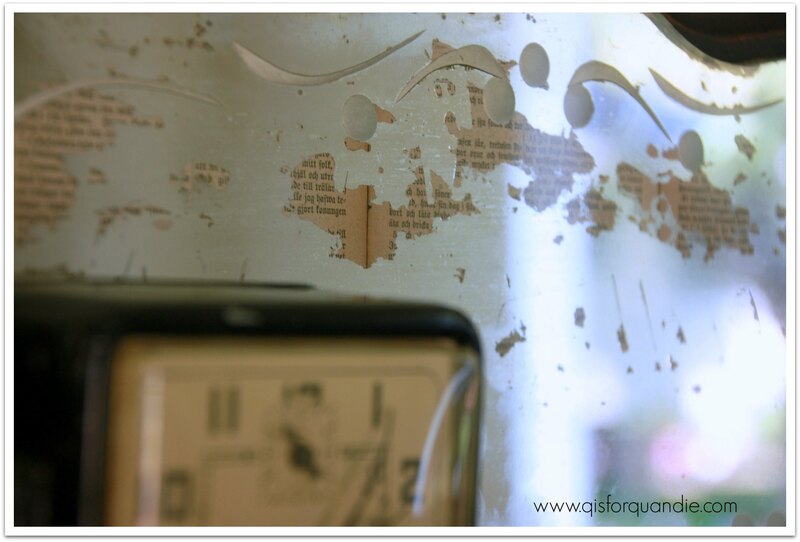 I used my trusty old Swedish bible and added it behind the mirror using a little spray adhesive to keep it in place. It’s a small detail that makes all the difference on this dresser. Adding that little touch of something unique that no one else has. I love the idea of a pop of deep black in an otherwise mostly white room, don’t you? I wish I could keep every dresser that I fall in love with, but that would classify me as a hoarder and we can’t have that. So this gorgeous bit of black magic is for sale. If you are interested in the particulars, leave me a comment and I will get back to you via email. Ooops, you missed it, this one is SOLD. One final B & A. Previous lake of the isles. Awesome job! Might be one of my favorites that you have done! (And I love so many!). Thanks for sharing! Have a great day!! Thanks Jody! I admit it is one of my favorites too. I have a lot of black pieces in my own house. I must be drawn to them. Beautiful….love it, love it, love it. The print behind the mirror is a stroke of genius…what a great overall look. It did truly finish off the piece. One of my favorites too! How beautiful! I am partial to black myself especially against a white wall. I would never have thought to leave the fan detail in the wood. Pinterest is pretty cool resource albeit a time vampire. This one is definitely on the top 5 list. I must admit, I LOVE pinterest. A great resource for so many things. Thanks Victoria! Gorgeous…gorgeous! Probably the most beautiful finishing job I’ve EVER seen! Wow! Thank you so much Jill! You’ve made my day! I like the way this one turned out. Still likes vintage. just beautiful. The newsprint is SO freaking cool! I use a lot of AS Graphite with dark wax over, but am longing for a truer black. Thanks for sharing the MMS paint option. And hemp oil? I have some, and never tried it! Just may have to put that on the list for this week’s projects! Thanks Lynne! I love using the hemp oil. So much easier to apply than wax. It will darken up your color more than wax though, so be prepared for that. It also doesn’t add quite as much protection as wax. But, I used it on a buffet I have at home, and it has been over 6 months now and I am not having any problems with stuff leaving marks on it. We don’t put sweaty drinking glasses on it or anything, but it gets fairly normal wear and tear. I always try to treat my waxed pieces with care, too…no wet washcloths or slices of pizza laying on them! I found a dresser that I’m going to paint with kitchen scale…gonna use the hemp oil. I can’t wait to get get out of work today to go work on it! I know just how you feel! When I get home from the day job tonight, I plan to start on another dresser that I am planning to paint with Trophy. I’m excited to get started on it too. Such a wonderful choice of color for this vintage piece! I just love leaving the natural wood on some pieces. It gives it such a different look from other pieces. Great job! Thanks Deborah! I’ve left the tops of things natural wood before, but this is the first time I left some decorative details natural. 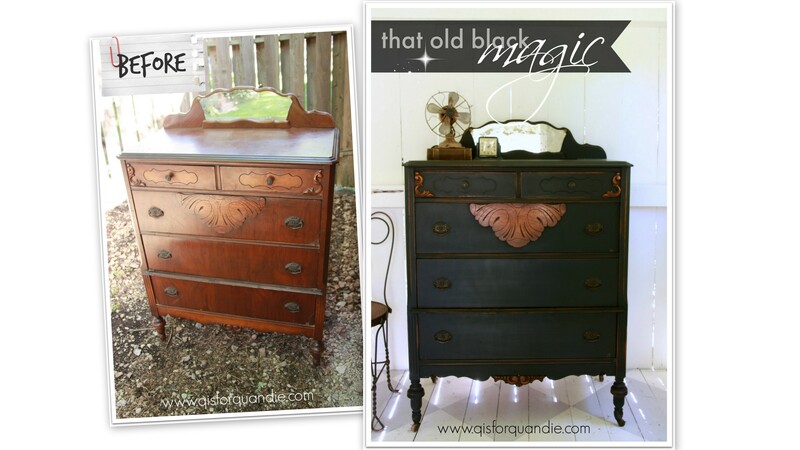 I think this dresser was the perfect candidate for that look. So Gorgeous! I love the black and the details wood. I have a piece that I think I will try black since I just ordered MMS typewriter and haven’t tried it yet. Thanks Darrielle! I do love the Typewriter. Just an FYI – I used hemp oil to get this deep, rich color. Not sure how dark it gets with wax, but if you try it let me know. Linda, We can almost get an exact date on this wonderful chest of drawers with the Art Deco mirror. I think it is very early 1930s. I think black is perfect with the color of the wood details. I just did an end table leaving some natural wood detail showing. I must be channeling you from Minnesota! Cool. It does have a sort of deco vibe to it, doesn’t it. I always appreciate your professional opinion Ginene! The decision to go with Typewriter and leave some of the details in the natural wood finish is perfect! Gorgeous! I think this is my very favourite piece. Really nice job on this piece. One of my favorites. Thanks! I’m getting such a positive response on this one, it is inspiring me to maybe do some more pieces in black. I don’t know, there is always such fierce competition! I’ll keep my fingers crossed that she picks me 😉 Thanks Terry! What a sweet piece, I love the mirror on the back! You chose the perfect finish for it! Oh wow! It looks incredible! Very nicely done. Thanks for taking the time to say so Jennifer! I appreciate it! Beautiful! I love the addition of the bible pages to the mirror. Thanks Maureen. Maybe I will start a trend! I’ve been reading your blog for a while but have never commented. I wanted to say I absolutely LOVE everything you do – your painting, the colors your choose, the way you style things. It’s very inspiring – thank you! Hi Kelli! Thanks for commenting. And thanks for your kind words. I really love sharing all of the stuff I do, so I am glad there are people out there like you who like to see it! The bible pages behind the mirror is BRILLIANT! I love that so much. 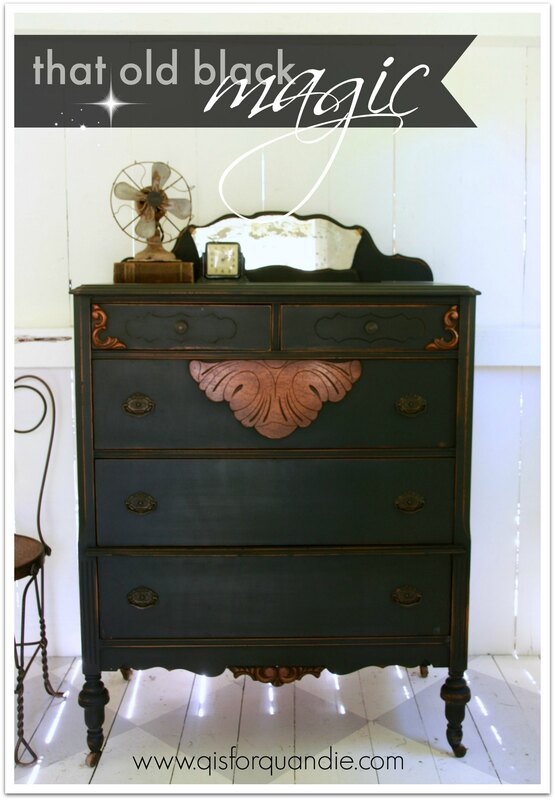 The whole dresser is just beautiful! What an inspiration! Thanks Patra! I do love how the mirror turned out, and it was super easy to accomplish. I am hoping to try that technique on more stuff in the future. Thanks for stopping by and leaving such a nice comment Judy! Its beautiful! 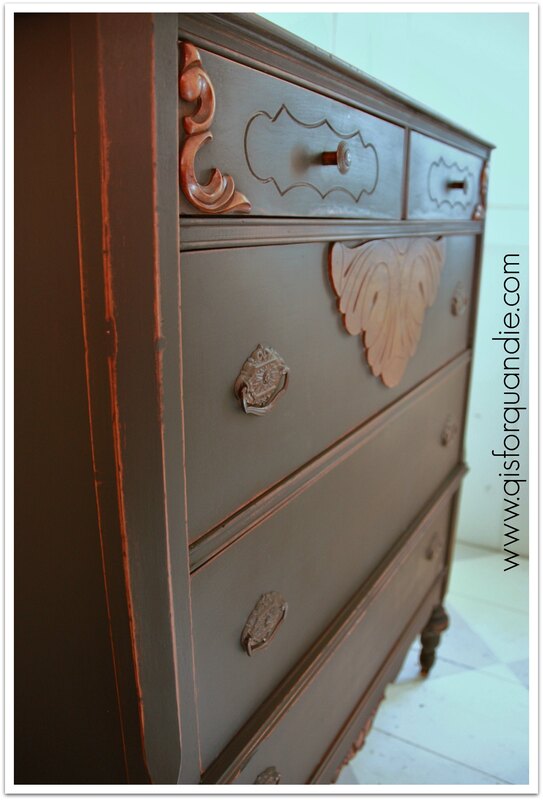 Both the dresser and the paint finish! Stunning! That is such a gorgeous dresser. Beautiful details. I love the way you finished it. Thanks Lauren, I would love it if you featured it! Thanks! Gorgeous chest! I had some issues though when I used Typewriter. The wax I topped it with turned white and super streaky when it dried. Ended up having to repaint the piece using a different black, ugh! Ever have those issues with Typewriter? Maybe I can try it with the hemp oil instead. The first time I used Typewriter, the paint dried to that sort of streaky, chalky looking finish and I thought “oh no, this is awful”, but adding the hemp oil finish totally changed it. I absolutely suggest trying it with the hemp oil. I usually stick to the hemp oil with the dark colors, including Artissimo, Boxwood and even Kitchen Scale. Although the table base I just painted in Boxwood ended up getting a dark wax finish, which was also very nice. I don’t think I have actually ever even tried a wax on the Typewriter. Bummer that it didn’t work out for you. There is nothing more frustrating than having to start over on something! I used Miss Mustard Seed milk paint in Typewriter, then finished with hemp oil on top.